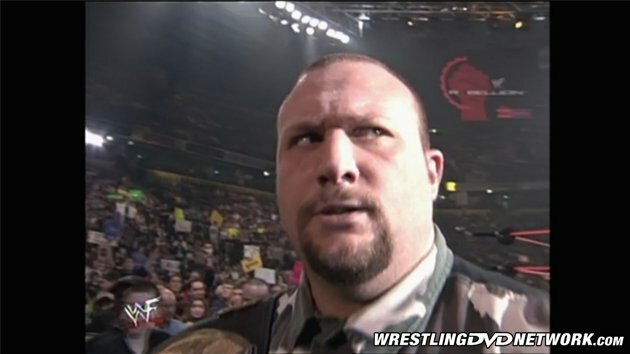 This week Throwback Thursday on WrestlingDVDNetwork.com is digging deep into the vaults of the WWE Network to look back on a rather obscure, classic WWF PPV from the “Invasion” era: WWF Rebellion 2001. Rebellion 2001 took place 15 years ago today during the tail end of the “Invasion Angle”, a period many fans who lived through it wishes they could forget, when both WCW and ECW had gone belly-up and the entire landscape of professional wrestling was in ruins. But the “Invasion Angle” wasn’t all bad (no, really). In fact, as demonstrated in this event, there was plenty to like and enjoy about the “Invasion” even if the biggest WCW stars weren’t involved. Context is not an issue whatsoever for this one – all previous RAW and SmackDown! episodes, as well as all previous PPVs, are available to watch now on the Network. The show opens with a great video package selling the Rock/Austin main event. In the arena Jim Ross and Paul Heyman welcome us to the show. The two discuss the double main event, Rock/Austin and Jericho/Angle, before sending it to the ring. This story had been brewing since Edge won the 2001 King of the Ring Tournament in June and only intensified when Edge won the first Intercontinental title of his career after dethroning Lance Storm at SummerSlam 2001. Christian turned on Edge on the September 3, 2001 edition of RAW and joined the Alliance after a backstage assault on Edge on the October 15, 2001 edition of RAW. Christian pinned Edge after a low blow at Unforgiven 2001 to win the Intercontinental title, only to lose it back to Edge in a ladder match at No Mercy 2001. Christian, however, won the European title from Bradshaw at the October 30, 2001 SmackDown! tapings, a match that was eventually cut from TV due to time. This is an old school cage match focused more on wrestling than brawling, that features some well placed, effective fighting. In the end, with Christian about to escape, Edge uses his own wrist tape to tie his “brother’s” feet together and leave Christian dangling as Edge climbs over the top for the win. After the match we see a video package highlighting Kurt Angle’s turn to the Alliance from the previous week’s RAW. Next we see Chavo, Jr. outside the “Female Locker” preparing to do an interview when Hugh Morris interrupts. They agree to both do the interview and barge in to find Trish Stratus wearing a towel. Trish convinces the two to interview Lita instead, which she assures them she’ll set up so long as they leave. These two put on a decent back and forth match here but it feels too much like a mid-card TV match. When Hurricane goes for the Eye of the Storm, Scotty blocks the move, hits a running bulldog, and connects with the W-O-R-M (which is o-v-e-r) for the pin at 8:55. Next we go back to the “Female Locker” where Trish is preparing Chavo, Jr. and Hugh Morris to interview Lita. The two wait outside the door for only a moment before peeking in and watching Lita as she dresses. Lita sees the two, rightfully freaks, and throws the bums out. We cut to Diamond Dallas Page who puts the UK fans down with a “motivational” speech. Not much of a match here. Every time DDP tries to get some offense going Show cuts him off until DDP goes after the knee. Page hits a Diamond Cutter but is unable to capitalize, which allows Big Show to hit the chokeslam for the pin at 3:16. Backstage we see more Hugh Morris and Chavo, Jr. This time they barge in on Molly Holly, who calls them perverts for trying to look at a superhero without her cape. Afterwards we see an Alliance round table involving Stone Cold, Debra, Kurt Angle, and Shane McMahon where they discuss momentum and winning. Angle makes a joke about being them being the Knights of the Round Table; Austin as King Arthur, Debra as Guinevere, Shane as Merlin, and Angle as Sir Galahad. Austin yells at Angle for being “pathetic” before storming off. This one starts out as a normal tag match but very quickly devolves into a strongman street fight full of potatoes and receipts. In all of the confusion and brawling Farooq is caught alone, first double-teamed by the Dudley’s before being wiped out with the Twist of Fate by Matt Hardy at 5:28 for the first elimination. The final fall of this match plays like an old school house show tag title match with the crowd as hot as the action. One mistake, however, is all the Dudley’s need, to hit Matt with a crushing 3-D to retain the WCW Tag Team titles at 12:01. After a classic “Do Not Try This At Home” promo JR and Heyman discuss the upcoming Rock/Austin main event before showing how Jericho and Rock lost the WWF Tag Team Championship to the Alliance’s Test and Booker T on the last week’s SmackDown!. We cut to Mr. McMahon sitting between WCW Champion Chris Jericho and The Rock. McMahon tells them to bury the hatchet for the good of “Team WWF”. McMahon demands the two shake hands and they do. Afterwards, Jericho chides Rock about losing another big match and the two fight on the floor until officials pull them apart. Before the match Regal taunts the crowd about spending their dole money to come and see him and about being the role model for their children. Part of one of the most memorable feuds of the era, Regal and Tajiri put on a stiff, even match that, while short, was good. Tajiri misses a moonsault late allowing Regal to cinch in the Regal Stretch for the victory at 5:56. Kurt Angle is in control for much of the early portion of this match until Jericho gets a second wind. In the end it becomes a battle of reversals with both men reversing the others signature submission holds and other maneuvers. When Angle goes for the Angle Slam Jericho reverses it into a school boy for the win at 14:51 to retain the WCW Championship. After the match Angle attacks Jericho and hits a huge Angle Slam before walking out. Backstage Michael Cole interviews The Rock about concentrating on his upcoming title match with Stone Cold Steve Austin with the issues with Jericho on his mind. Rock riffs on Cole wanting English Pie or English Strudel before going off about winning the WWF title from Stone Cold. Another classic Rock promo. Women in WWE have come a very long way in 15 years. This match has less to do with wrestling than skin and cat calls. In fact the wrestling in this match is atrocious, even with Lita and Molly Holly involved. After Torrie slingshots Molly into Stacy, Lita hits the Twist of Fate on Molly for the win at 4:17. After the match Stacy gets in Trish’s face about the refereeing and pushes Trish. Trish slaps Stacy and hits a running bulldog for good measure before the WWF babyfaces head up the ramp together. Next up we get a great video package highlighting the continuing war between The Rock and Stone Cold Steve Austin. This match, like most Rock/Austin matches, starts as a street fight before the action settles down in the ring. Eventually the fight goes back outside the ring where the two toss each other on the announcer’s table and fight for all their worth for the WWE title. Late in the match the referee goes down and the two trade sharpshooters. Angle runs in and hits Rock with a steel chair. Moments later Jericho runs out and attacks Angle with the chair. Rock stands up and thinks Jericho hit him with the chair and knocks Y2J from the ring. Austin survives a Rock Bottom when Angle comes back in and attacks The Rock, who fights Angle off. Rock goes for The People’s Elbow when Angle grabs Rock’s foot and hits him in the head with the WWF title. Rock staggers into a Stone Cold Stunner to end the match at 22:09. 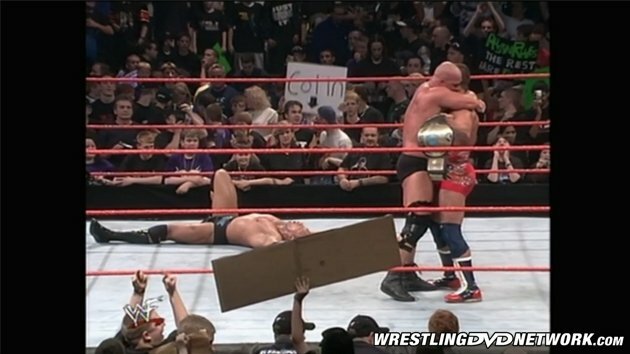 After the match Austin uses Angle to stand up and gives the WCW U.S. Champion a hug before walking out as the PPV goes dark. Taking place 15 days before the end of the “Invasion Angle” at Survivor Series 2001, this UK exclusive PPV offering finds the WWF firing on all cylinders, plotting for the future not in only in respect to talent but to the 4-man Undisputed World title tournament to come in December. So, while the angle didn’t go as planned (or desired), Rebellion 2001 stands out as one of the better shows of the time. If you haven’t seen it, and are already subscribed to the WWE Network, make sure you check it out and, as always, let us know what you think in the comments. That’s it for the latest TBT on WDN – until next week, see ya at ringside! Watch every WWE PPV in history (Survivor Series 2016 included), and 6,000 more hours of content only on WWE Network. Your first month is FREE! Click here to subscribe to WWE Network. No doubt an entertaining show overall. Just curious though as to why Kane or Taker weren’t on the card. Figured no one could find suitable opponents for them. But then I noticed Booker T and Test didn’t have a match either. Would’ve been a suitable match for a UK ppv like this I would think. Not that this is a complaint about them not wrestling. I believe Edge wont it at a house show then lost it back to Jarrett the next night at Fully Loaded. Yeah, Edge won it at a house show, a Skydome house show, I think. That was rare back then for titles to switch at house shows. I liked that fancam look of it. Wish they had done a bit more of that. Thanks for reading and leaving a comment! Edge won his second intercontinental championship at summerslam 2001. His first was at a live show in 1999 when he defeated then champion Jeff Jarrett for the title. Right you are! That’s on me for using a lousy source. This was the first U.K. PPV I saw since the One Night Only VHS tape so I knew not to expect the quality of a regular PPV but it was an overall enjoyable show. Christian won the IC champ strap at Unforgiven 2001, not Judgment day. 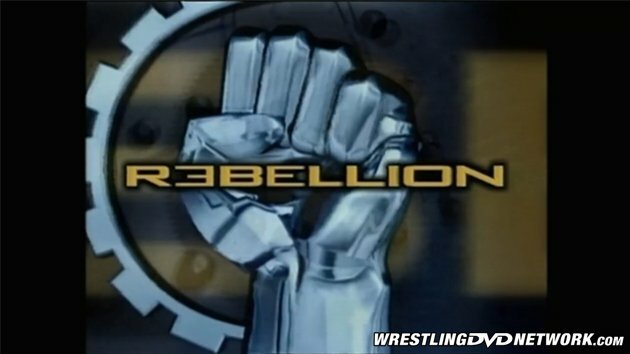 I always loved the logo for the Rebellion shows.. fist ready for a fight.. Thanks for the heads up. I would’ve responded sooner but I’ve been ill. The logo, indeed, was great. That error was on me. I flipped the order of their names and never switched the stables. Oops. Like I said above, I would’ve responded sooner but I’ve been ill. Thanks for reading and pointing out the flubs. Have a good one!